The SharkBite® connection system uses an advanced push-fit design that works in two stages. When the tube is inserted into the fitting it passes the first stage through a release collar and then through a stainless steel grab ring. The grab ring has teeth that open out and grip onto the tube. At the second stage the tube is pushed through an o-ring protector which aligns the tube. A specially formulated o-ring is then compressed between the wall of the fitting and the tube before the end of the tube reaches the tube stop. Only when the tube has passed through the o-ring and reached the tube stop, is a secure joint created. 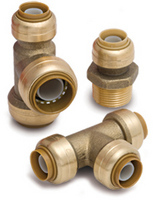 The SharkBite® fittings have an integral Tube Support Liner that is effective in supporting PEX tubing to ensure the o-ring seals correctly on the outside of the PEX tubing. The Tube Support Liner is not required for use with CPVC and copper tubing; however these two types of tubing fit over the Tube Support Liner easily and hold it against the tube stop. U060 Reducing Coupling 1" x 3/4"
U724 Fitting Reducer 3/4" x 1"